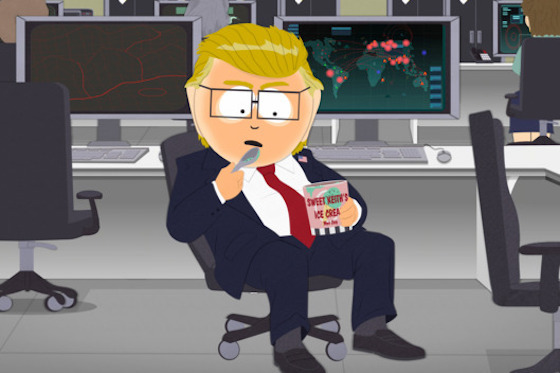 "It was like, 'Dude, we're just becoming CNN now'"
The two most recent seasons of South Park found creators Trey Parker and Matt Stone satirizing Donald Trump through the show's character Mr. Garrison, but now Parker says the joking has become as old as the big orange blowhard himself. Speaking to the Los Angeles Times, Parker indicated that the show's forthcoming 21st season would sidestep skewering Trump any further than they already have. "We fell into the same trap that Saturday Night Live fell into, where it was like, 'Dude, we're just becoming CNN now,'" Parker said in referencing the show's previous season. "We're becoming: 'Tune in to see what we're going to say about Trump.' Matt and I hated it, but we got stuck in it somehow." He continued: "This season I want to get back to Cartman dressing up like a robot and [screwing] with Butters. Because to me that's the bread and butter of South Park: kids being kids and being ridiculous and outrageous but not 'did you see what Trump did last night?' Because I don't give a ... anymore. We probably could put up billboards — 'Look what we're going to do to Trump next week!' — and get crazy ratings. But I just don't care. South Park celebrated its 20th anniversary last year. It is currently set to run through a 23rd season in 2019. South Park returns for its 21st season on August 23.